Arun’s father and veteran actor Vijayakumar was immediately alerted and he reached the station and now he’s been let out on bail. It was heard that he was returning from sangeeth function of cricketer Abhimanyu Mithun and Tamil actress Radhika Sarathkumar’s daughter Rayane, which was held in a Star hotel in Nungambakkam. It was heard that this incident took place at 3 am. 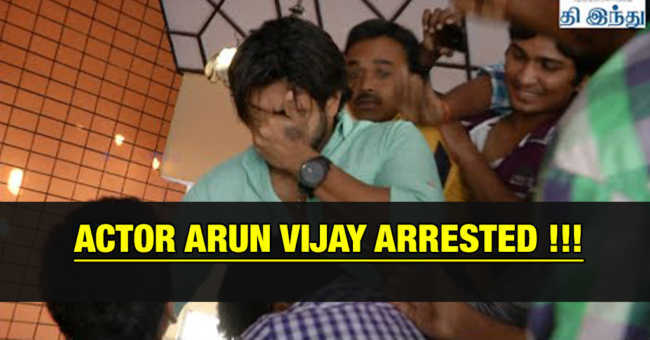 Though there was no casulities, a case was filed against Arun Vijay since the police jeep was damaged. After the investigation, police came to know that, he has consumed alcohol. Pondy Bazaar Traffic police Investigation Unit has registered a case under motor vehicle law and Indian Penal Code 279. Rumors doing rounds suggest that the actor was on an inebriated stage when the accident occurred and he has been booked under the sections to punish Drunken drive. However, we will have to wait or the official statement from the actor or from the police to know the exact details of the case.